Off the back of a terrific weekend of adoptions at our North Melbourne shelter where nine cats, eight kittens and 16 dogs all found loving new homes; we hope the adoption love spreads to all our shelter animals, including one particular cat who has captured our hearts — Quill. With her distinctly grey coloured nose (as though it were lightly dipped into an ink well), Quill is poised to leave her mark on your heart within moments of meeting her. A big fan of human company, Quill is an affectionate two-year-old grey tabby, who loves vigorous pats and scratches and will not hesitate to remind you to continue with persistent head butts to your hand. Her morning routine consists of a thorough groom by a window after breakfast; some long feline yoga poses and stretches before she retreats to a quite low-lit space or a vacant lap for some snooze time. Beautiful in nature as she is in appearance, sadly Quill’s life prior to the shelter was not so kind to her. 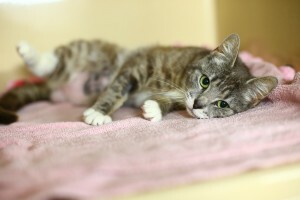 Arriving at our North Melbourne Shelter with sustained injuries to her hind leg, Quill was in a terrible state of pain. How she got into such a state remains a mystery and after the mandatory eight day period to be claimed by her owner, Quill remained without a home. Admitted to our shelter hospital, Quill was examined by our vets. After careful consideration it was decided an amputation of the injured leg was necessary to prevent early onset arthritis and to preserve her health and wellbeing. Making a quick and successful recovery, Quill undertook her rehabilitation at our Sick and Injured centre where she has made daily progress adapting to life without her hind leg, even being able to jump back into her condo with complete ease. If you love nothing more than long afternoons reading a book seated in your favourite arm chair in the quietest corner of your home, Quill will be right by your side or most likely on your lap soaking in the downtime. The ideal match for a homebody, this chilled-out cat will also make a terrific member of a family with or without children and other pets. 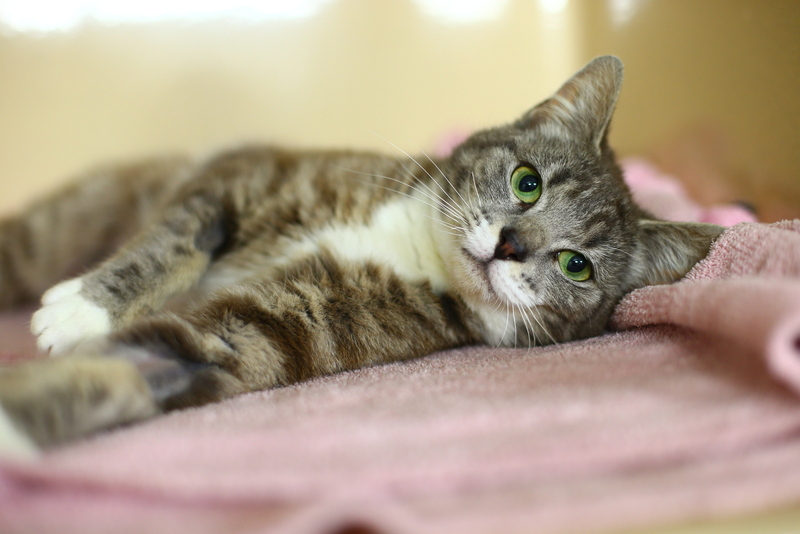 As she is learning to live with three-limbs, Quill will need to strictly be an indoor cat to protect her from potential hazards and injuries. Quill, like all our adoption candidates has received a full health check, has been vaccinated, wormed, desexed and microchipped. 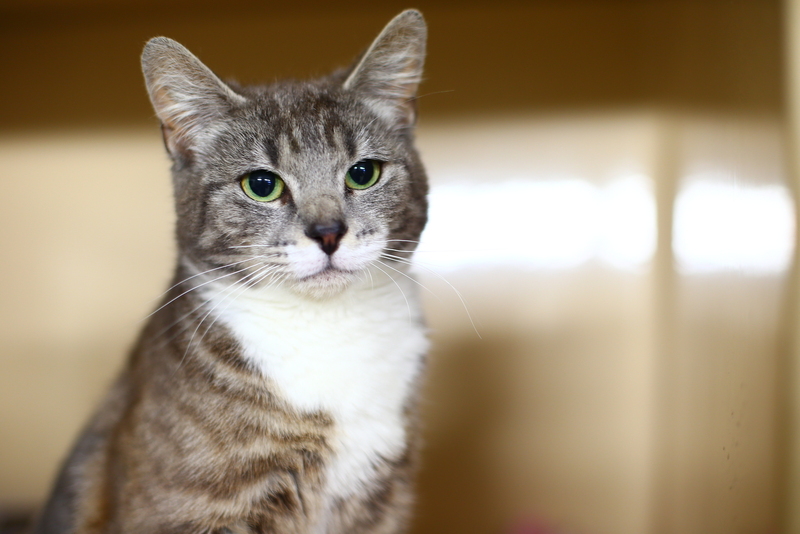 If you have the heart and home for this darling cat, please check out her profile, call our North Melbourne shelter on 03 9329 2755 or visit her in person.